Learn all about Tablets including Uncoated, Coated , Film-coated, Dispersible, Modified-release, Enteric-coated, Prolonged - release and Soluble Tablets. Tablets are solid dosage forms each containing a unit dose of one or more active ingredients. They are intended for oral administration. 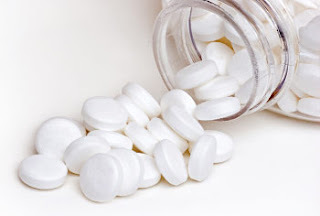 Some tablets are swallowed whole or after being chewed, some are dissolved or dispersed in water before administration and some are retained in the mouth where the active ingredient is liberated. Because of their composition, the method of manufacture or use, tablets are of a variety of characteristics and there are several categories of tablets. Tablets may be coated or without coating. Tablets are usually solid, circular, the end surfaces of which are flat or convex and the edges of which may be beveled They may have other shapes like triangular, rectangular, etc also. They may have break lines or break-marks and may have any symbol or another marking. They are sufficiently hard to withstand handling without breaking. During manufacture, packaging, storage and distribution of tablets, suitable measures are taken to maintain their microbial quality. Tablets are prepared by compression of equal volumes of powder or granules by applying high pressure with the help of punches and dies. The particles to be compressed consist of one or more active ingredients, with or without excipients. Uncoated tablets are generally single-layer tablets prepared by a single compression of granules or multi-layer tablets consisting of parallel layers prepared by compression of granules of different compositions. No treatment is given to such tablets after compression. Any added substances are not specifically intended to modify the release of their active ingredients. The addition of flavors to uncoated tablets other than multi-layer tablets is not official unless permitted in the individual monograph. Uncoated Tablets have the general characteristics of tablets. Disintegration: Use water as the liquid. Add a disc to each tube. Operate the apparatus for 15 minutes, unless otherwise stated in the individual monograph. Examine the state of the tablets. If the tablets fail to comply because of adherence to the discs, repeat the test on a further 6 tablets omitting the discs. The tablets comply with the test if all 6 tablets have disintegrated. The test does not apply to chewable tablets. Coated tablets are tablets covered with one or more layers of mixtures of various substances such as resins, gums, inactive and insoluble fillers, sugars, plasticisers, polyhydric alcohols, waxes, etc. The coating may also contain active ingredients. In compression-coated tablets, the coating is applied by compressing around the tablets granules prepared from tablet excipients such as lactose, calcium phosphate, etc. Substances used as coatings are usually applied as a solution or suspension in conditions in which evaporation of the vehicle occurs. When the coating is thin, the tablets are described as film-coated. Coated tablets may contain flavoring agents. Coated tablets have a smooth, usually polished and often colored, surface; a broken section examined under a lens shows a core surrounded by one or more continuous layers of a different texture. Disintegration: For coated tablets other than film-coated tablets. Use water as the liquid. Add a disc to each tube. Operate the apparatus for 60 minutes, unless otherwise stated in the individual monograph. Examine the state of the tablets. If any of the tablets has not disintegrated, repeat the test on a further 6 tablets, replacing water with 0.1 M hydrochloric acid. The tablets comply with the test if all 6 tablets have disintegrated in the acid medium. Carry out the test described above but operate the apparatus for- 30 minutes, unless otherwise stated in the individual monograph. If coated tablets fail to comply because of adherence to the discs, repeat the test on a further 6 tablets omitting the discs. The tablets comply with the test if all 6 tablets have disintegrated. Dispersible tablets are uncoated or film-coated tablets that produce a uniform dispersion in water and may contain permitted flavoring and sweetening agents. However, if saccharin, including its sodium and potassium salts, is used as a sweetening agent, its concentration in dispersible tablets meant for pediatric use should be restricted so as to limit its intake to 5 mg/kg of body weight. Disintegration: Determine at 24°to 26° and operate the apparatus for 3 minutes. Effervescent tablets are uncoated tablets generally containing acidic substances and either carbonates or bicarbonates which react rapidly in the presence of water to release carbon dioxide. They are intended to be dissolved or dispersed in water before administration. Disintegration: Place one tablet in a 250-ml beaker containing water at 20° to 30°; numerous gas bubbles are evolved. When the evolution of gas around the tablet or its fragments has ceased the tablet shall have disintegrated, being either dissolved or dispersed in the water so that no agglomerates of particles remain. Repeat the operation on a further 5 tablets. The tablets comply with the test if each of the 6 tablets disintegrates in the manner prescribed within 5 minutes unless otherwise stated in the individual monograph. Modified-release tablets (Sustained-release tablets) are coated or uncoated tablets containing auxiliary substances or prepared by procedures that, separately or together, are designed to modify the rate or the place at which the active ingredient is released. Modified-release tablets include enteric-coated tablets, prolonged-release tablets and delayed-release tablets. Enteric-coated tablets (Gastro-resistant tablets) are delayed-release tablets that are intended to resist the gastric fluid but to release their active ingredient(s) in the intestinal fluid. For this purpose substances such as cellulose acetate phthalate and anionic copolymers of methacrylic acid and its ethers are used for providing tablets with a gastric-resistant coating or for covering either granules or particles with a gastric-resistant coating. Enteric-coated tablets have the characteristics of Coated Tablets. Disintegration: If the tablet has a soluble external coating, immerse the basket in water at room temperature for 5 minutes. Suspend the assembly in the beaker containing 0.1 M hydrochloric acid and operate without the discs for 120 minutes, unless otherwise stated in the individual monograph. Remove the assembly from the liquid. No tablet shows signs of cracks that would allow the escape of the contents of disintegration, apart from fragments of the coating. Replace the liquid in the beaker with mixed phosphate buffer pH 6.8, add a disc to each tube and operate the apparatus for a further 60 minutes. Remove the assembly from the liquid. The tablets pass the test if all six have disintegrated. Dissolution: For tablets prepared from granules or particles already covered with an enteric coating, the dissolution test is carried out to demonstrate the appropriate release of the active substance(s). Prolonged-release tablets, also known as sustained-release tablets or extended-release tablets are tablets formulated in such a manner as to make the contained active ingredient available over an extended period of time after ingestion. Dissolution: The test should be designed to demonstrate the appropriate release of the active substance(s). The manufacturer is expected to give specifications for drug release at 3 or more test-time points. The first point should be set after a testing period corresponding to a dissolved amount of typically 20 percent to 30 percent. The second point should define the dissolution pattern and should be set at around 50 percent release. The final point should ensure the almost complete release that is generally understood as more than 80 percent release. Carry out the test as per the manufacturer's specification for the indicated test-times. Soluble tablets are uncoated tablets or film-coated tablets that are to be dissolved in water before use. The solution produced may be slightly opalescent due to added substances used in the manufacture of the tablets. Disintegration: Soluble tablets disintegrate within 3 minutes. The test is carried out using water at 15· to 25·. Tablets for use in the mouth are usually uncoated tablets formulated to be chewed or to effect a slow release and local action of the active ingredient (lozenges) or the release and absorption of the active ingredient under the tongue (sublingual tablets). Chewable tablets and lozenges may contain flavoring agents.